Do you suffer from stress or anxiety? Do you struggle with the overwhelm and pressure of daily life? Then this could be a good episode for you. Today our guest is coming all the way from Sydney, Australia! He is the founder of The Stillness Project and his name is Tom Cronin. Tom is a meditation teacher, life mentor, speaker, writer & producer – amongst many other things. And Tom believes the portal to reduce stress and access stillness and calm in our lives is through meditation. As a meditation teacher for many years, he has inspired thousands of people all over the world to unlock their brilliance and calm. But Tom’s journey to find stillness has not always been easy. The Stillness Project is a movement of change. 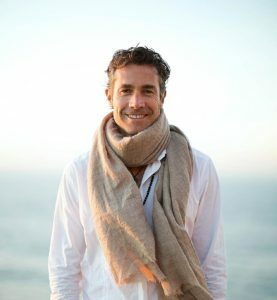 Using multiple streams – from films and online courses to retreats, blogs, books, and personal mentoring, his goal and the hope of The Stillness Project is to inspire 1 billion people to sit in Stillness daily to connect with their inner Being and transcend the barriers of separation. The hope is to encourage a movement of awakening on our planet. Our world could certainly benefit from more humans who are connected and spreading love – so, thank you, Tom! Why do people resist meditation? Most people (possibly even you) may think that it’s hard or that you won’t be able to do it. Well, you’re about to find out that this is not the case at all. This is all totally understandable however this can all be resolved with the right meditation method. If you want to learn more about incorporating meditation into your daily life definitely check this course out. Tom will teach you how you can transform your life in just 20 minutes a day! One of my favorite parts about meditation is that it’s a way to help me remember who I really am, a way to reconnect with my truth- my authentic self – amidst the chaos and stress of the modern world. A way to connect to the universal energy and recharge through that energy. It gives my mind a moment to rest and it turns up the volume on the voice of my soul. Often times we look outside for answers or validation only to be left feeling empty, confused and alone. What if the answers are within? What if all that you need is within? What if all that you are so desperately longing for the world to give you is within? When we look inward and find stillness we are reminded of our infinite power and connectivity with all that is. To come from a place of authenticity is where we are our most powerful in life. What if our only goal in life was to discover how to be ourselves? To be our TRUE selves and to peel away all the false layers and barriers that prevent us from being ourselves. What would that look like for you? How would your priorities change? What would you do differently?